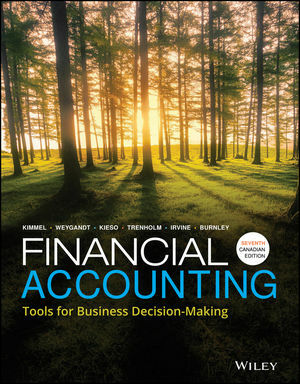 The new seventh edition of Financial Accounting: Tools for Decision-Making by Kimmel, Weygandt, Kieso, Trenholm, Irvine and Burnley continues to provide the best tools for both instructors and students to succeed in their introductory financial accounting class. It helps students understand the purpose and use of financial accounting, whether they plan to become accountants or whether they simply need it for their personal life or career. The book’s unique, balanced procedural and conceptual (user-oriented) approach, proven pedagogy and breadth of problem material has made Financial Accounting the most popular introductory text in Canada. This hands-on text, paired with a powerful online teaching and learning environment, WileyPLUS with ORION, offers students a practical set of tools for use in making business decisions based on financial information. Appendix A: Specimen Financial Statements: The North West Company Inc. Appendix B: Specimen Financial Statements: Sobeys Inc.
NEW author added to the team gives this text the advantage of having three top Canadian accounting academics on the author team. No other author team has the same background in terms of understanding today’s accounting standards. The authors collaborated closely throughout the writing and the production process to ensure that the text is technically accurate, relevant, and up-to-date. NEW Problem Walkthrough Videos walk students step-by-step through solutions to homework problems. Based on problems that are “similar to” (but not the same as) the problems that students will find in their homework assignments. NEW Recurring illustrations show students the big picture of the accounting cycle. NEW Accounting Cycle Review problems are comprehensive cases that incorporate the accounting cycle. NEW Review and Practice Sections added to each chapter include an overview of the learning objectives, key terms, differences between IFRS and ASPE, and decision tools in addition to practice opportunities using the Decision Toolkit and a comprehensive Do It! New Practice objective-format questions are a great tool for students to gauge their level of understanding of the material in the chapter in a relatively quick fashion. Detailed solutions and feedback is provided for these questions. NEW All end of chapter material is tagged to CPA competencies, Bloom’s Taxonomy, as well as AACSB. The Toolkit Approach shows students how to use accounting concepts to make decisions, no matter what their role. Decision-making involves critical evaluation and analysis of the information at hand, and this takes practice. At the end of each chapter, the Practice Using the Decision Toolkit activity provides a comprehensive demonstration of an analysis of a real-world problem using the decision tools presented in the chapter. The Accounting Matters theme continues to be at the centre of this new edition and further enhances the importance of accounting to all disciplines, emphasizing the relevance of accounting and the strategic use of accounting information. Real world focus offers students exposure to realistic business situations, financial information and accounting practices of real companies, including the ones that are already using IFRS. All corporate information has been updated and revised to reflect the latest available financial information. A unique feature of this text is the intracompany, intercompany, and industry comparisons used when interpreting financial information, similar to what is done in the real world.